The Cherry trees are now in full bloom in Washington D.C. and area photographers wait anxiously for when they are in their full glory. A four a.m. departure had me arrive at the Tidal Basin at 5:15 a.m. I thought I had gotten there quite early as sunrise wasn’t until 6:30. But it seemed that I wasn’t the only excited photographer wanting to get out and photograph the blossoms. Being a Saturday, and the first clear day after a week of dreary and rainy skies, it wasn’t a surprise that it was to be a busy day along the water. The monuments glistened in the water before the sky began to glow. The photographers busy with their craft, lined the walkway all around the basin. The sky began to lighten and the real fun began. 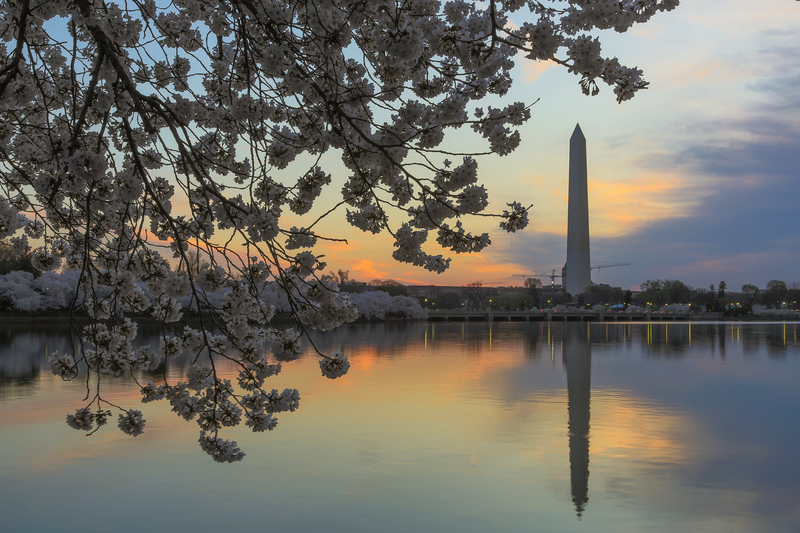 It’s nearly 100 years since the Mayor of Tokyo first gifted Japanese Cherry trees to the Mayor of Washington D.C. Celebrated with a two-week long festival, the true stars are the cherry blossoms. Even in 1920, photographers flocked to the basin to capture these stunning beauties. Once the trees reach full bloom, it’s not long before they begin to fade. Truly one of those moments that is fleeting and makes one step out of their busy lives and walk beneath the cherry trees. Great pictures. I am heading there in the morning. Good luck Jack ! Are you going early? I got there at 5:15am and it was already busy. Drove there and parked on Ohio Street. Parking can also be found at Haines Point. There is Handicap parking near the Jefferson Memorial along Ohio Street. Go in by Independence Ave. Thanks Sheryl, myself and about a million others enjoy them just as much. Great pictures! I went for a run there this morning at 6:30 thinking I was going to beat the crowds – I was amazed at how many people were already there! Those are the ones I was most excited about Joanne. I’ve been wanting to do night shots of the monuments for years, but never made the time. I loved being there, it’s been a couple of years. Thanks! Me too ! At 5:15am ? The bridge was packed with photogs. Crazy stuff. Indeed it was the start of a HUGE tradition in DC. Now there are hundreds of Japanese cherry trees throughout the city. Such a wonderful thing. I especially like the close ups, those with the monuments reflected in the water and – I have to ask – is that a photo of the martin Luther King memorial ? Yes it is ! Wow, I’m impressed that you knew and recognized the MLK memorial. It is certainly a new addition to the scene. I saw it a couple of years ago and they planted newer cherry trees around it. They’ve grown in and it’s beautiful there. Thank you so much! Was in Washington last autumn (fall) and that – and the Marines Monument – were the ones that really impressed me. How does it actually work that the flag in the Marines Monument seems to be raised as you come down the hill? Wow! I’d love to see that! Simply magnificent. Thanks for sharing. Thank for your share! beautiful city! Truly my pleasure and so pleased that you enjoyed this post. Believe it or not, they are scentless. Can you imagine if they did? WOW !! You are truly more than kind Mary. Thank you my dear. Oh how I wish you could enjoy these one day Sarah. They are so beautiful. Thanks Cynthia ! This morning so was beautiful.